Microsoft Is Phasing Out Internet Explorer : The Two-Way The Web browser will be replaced in Windows 10, with what's currently being called Project Spartan. 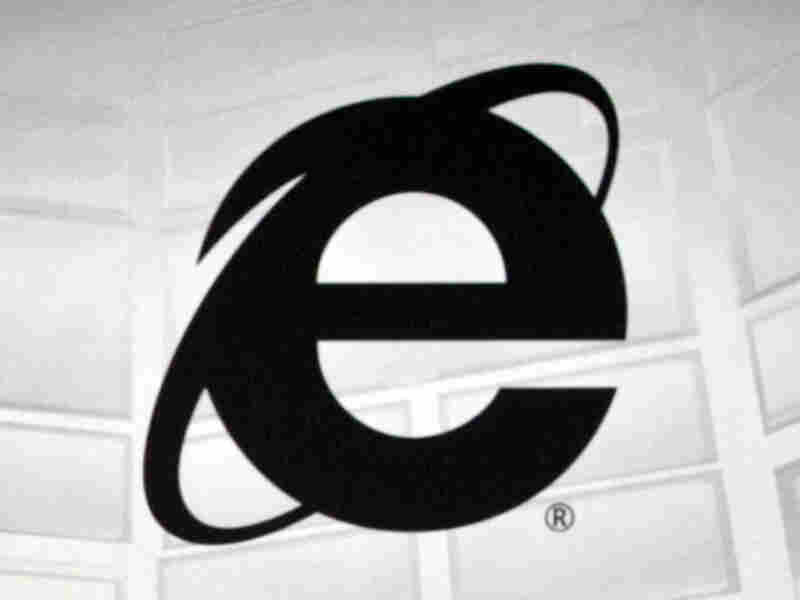 The logo of Microsoft's Internet Explorer, the Web browser due to be phased out in the next version of Windows. Clippy will soon get a roommate in Microsoft heaven or hell, depending on your perspective. This week, Microsoft announced that it will phase out Internet Explorer, its much-maligned Web browser, beginning with Windows 10. The news came at the Microsoft Convergence conference this week, where marketing chief Chris Capossela announced IE's replacement: Project Spartan. That's still a code name and will likely change, but there are some things about Spartan that seem to be already set in stone. It will come with a personal Web assistant called Cortana, a special reading mode, a more streamlined layout and new annotation tools that work with keyboards or pens. Internet Explorer will linger on for a bit, though. In Windows 10, some versions will keep the option to use IE in order to work with older programs and devices. "Internet Explorer, first released in the mid-1990s, dominated the browser market at its peak in the early 2000s, but it came to be associated with poor security and compatibility with other browsers and has since languished. Spartan's success is critical if Microsoft is to remain relevant in the Web browser business — a market in which it used to dominate but now trails Google's Chrome. According to data from StatCounter, in February, Chrome had 43.2 percent of the global browser market (including desktop, mobile, and other platforms), while Internet Explorer captured 13.1 percent and Firefox had 11.6 percent." NPR spoke with AdWeek's Kristina Monllos about the challenges Microsoft will face in shaking off IE's troubled legacy. For starters, she agreed that IE should have been gone a long time ago. "Putting Internet Explorer to bed is something that makes sense for the company now," she said. "In fact it's even maybe an overdue move." Monllos added that ditching IE alone won't be enough. Microsoft will have to overcome the stigma left behind. "The Internet Explorer brand is so tainted," she said. "When you think of Internet Explorer the first thing you think of is that it's slow. Or, 'that still exists?'" Monllos said it will be very easy for Spartan, even though it's new, to be stuck with those types of opinions, so Microsoft will have to work extra hard to prove that Spartan is really different. "They don't want people to see it as if they're just putting lipstick on the Internet Explorer pig." And on top of that stigma, Microsoft will be trying to convince millions of IE users, as well as those who have moved on from Microsoft Web browsing software and might not be willing to come back. "By introducing a new browser, you're asking people to change their daily habits," Monllos said. "If someone is used to Chrome or used to whatever it is they use, they probably don't want to change." Of course, for all the celebration about IE's demise, it's still a very popular program, controlling by some estimates almost a quarter of the desktop browser market. And NPR managed to find an Internet Explorer fan who's actually sad to see the program go. After we put a callout on Facebook, we got an email from Kim Kauer, who runs two small businesses in Michigan. She said that the news came as a shock. "It freaked me out," she said. "It's all I use! And I don't like change." Kauer said Internet Explorer is actually faster than the other browsers she's tried, like Firefox and Chrome. And, she said it's the only browser compatible with all the accounting software she uses in her work. Even though IE will still be available to her for some time, Kauer said she's still going to take a little time to mourn the browser's impending death. "I'm thinking a good martini, with anchovy olives will be appropriate." And she said she'll put off upgrading software or buying new devices, if it means she can keep Internet Explorer. "I'll hang on to my old stuff, as long as possible."